As I mentioned yesterday, I'll be debating whether psychiatric hospitals should ban smoking outdoors next month. My debating partner will be a former service user known by the Twitter handle @Sectioned_ (hereafter known as S). A few weeks we both received an e-mail from the British Medical Journal asking whether we'd write an article putting our case, to be published alongside an article by the proposition. Ever since the BMJ started commissioning hatchet jobs against people who disagree with them on policy I have wanted nothing to do them so I didn't reply, but S agreed to write a piece for them. Her article was submitted in good time. I saw it yesterday and it is a powerful, well written piece. However, the BMJ demanded a series of last minute deletions and edits on grounds which strike me as being spurious. As a result, it will not be published. Despite the BMJ's claims about potential legal difficulties with the article, a different journal has offered to publish it, but it will be many weeks before they do so and the London debate will be a distant memory by then. The justification for these deletions is that, the BMJ claims, I will be identifiable at the Maudsley public debate; that staff on the ward where I was detained may be in the audience; that they may recognise me all these years later; and that the NHS trust responsible for the ward where I was detained could sue the BMJ for libel. To try to accommodate those concerns, I offered a number of different forms of alternative wording. I offered, in place of the deletions, the phrase “BMJ legal advice says I may not refer in this article to other experiences on ward or the impact it has had on me.” I offered to sit on the panel wearing a face mask. I offered to sit in the room next door to the lecture theatre – the room where a patient can sit if their case is presented to doctors or medical students and speak via video link – and participate in the debate via video link with my back to the camera. BMJ refused. It was the deletions in their entirety, or nothing. It's been a vintage week for junk science - one of the best in living memory - and it just keeps coming. Smokers drink more than non-smokers so it would not be surprising if the same is true of vapers. However, the headline falls down in the second half when it claims that vaping actually causes drinking. People who use the devices are significantly more likely to consume more alcohol than those who don't use them, researchers claim. Moreover, those using e-cigarettes and alcohol together report drinking more. These two sentences seem to be saying exactly the same thing in different ways, but never mind. Usually, when people quit smoking they also quit drinking, the researchers said. Therefore, those who use e-cigarettes to quit smoking may miss out on this added benefit of quitting, they said. Sorry to break it to you, but people don't stop drinking when they give up smoking. At least, they don't stop drinking for good. Some people might find that avoiding alcohol helps them to maintain the discipline to break the habit, but that isn't an 'added benefit', it is an added cost. The researchers concluded by urging people not to ignore the 'knock on' effects of e-cigarette use. 'This area of research is extremely important and I don't want it to get pushed to the side,' said lead author Alexandra Hershberger, of Indiana University-Purdue University. You're sounding a bit needy there, Alexandra, if I'm honest. Will someone please give this woman a research grant so she shuts up? Previous studies have revealed a strong link between cigarette smoking and drinking, so the researchers hypothesised that a similar connection may be found with e-cigarette use and alcohol. They asked two different groups of people who drank alcohol about their habits regarding e-cigarettes. In both groups, the survey revealed alcohol consumption led to e-cigarette use and vice versa. However e-cigarette users were significantly more likely to drink problematically than non-users in both groups. What's more, those who expected to use the devices and alcohol together reported drinking more. 'If you quit smoking cold turkey, it affects other behaviours associated with smoking, such as drinking,' said Ms Hershberger. 'By replacing smoking with e-cigarette use, it could be that you're at risk of continuing behaviours you don't want to continue. Firstly, who's saying that people don't want to drink? Secondly, how did the vapers compare to the smokers? You don't know, do you? 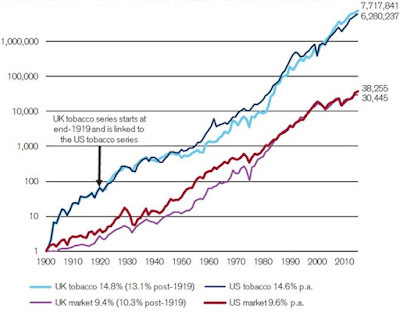 You didn't bother to look at smokers because, like most 'public health' morons, you imagine that if people didn't vape they would be completely abstinent from nicotine use. Did you study people who are addicted to alcohol? No. Never mind. You don't need to do the research to hypothesise that e-cigarette users are more likely to be addicted to alcohol. I'll bet you that they are also more likely to gamble, take drugs and be promiscuous. How do I know? Because smokers are more likely to do all those things, and vapers are the same people. The smoking doesn't cause these behaviours, however, and nor does the vaping. The underlying mechanisms are personality type and risk tolerance. The study also revealed that more women use e-cigarettes socially than men. In general, men report more risk-taking behaviours than women, including smoking, drinking and drug use. It's hardly surprising that they are more likely to switch to a less risky nicotine product then, is it? The findings suggest that women may not perceive e-cigarette use as risky. It's not risky - or rather it's not risky in the sense that any normal human being would define the word. And it is certainly much less risky than smoking cigarettes, so there is nothing remotely surprising about risk averse groups being drawn to them. 'We were surprised to see higher e-cigarette use in women,' said Ms Hershberger. So they should be, despite the best efforts of the irresponsible, scare-mongering 'public health' racket. Considering you've just conducted a study that confirms the bleeding obvious and you're surprised by every one of its banal findings, I wouldn't put too much stock in your expectations. The research was published in Addictive Behaviours. Then the editor should be familiar with the concept of co-morbidity. The video below has been doing the rounds today. It shows a psychotic anti-smoker yelling at a woman in a park in Australia. A few years ago, this guy would have been grabbed by the police, tranquilised and sent to the funny farm. Today, he has the law on his side. Smoking is banned outside in a growing number of places in Australia. Anti-smoking fanaticism has become institutional. The report looks at the various reasons (ie. excuses) used to justify banning smoking outside. None of them stands up to the slightest scrutiny. For example, the tobacco controllers say that smoking outside creates litter while, at the same time, removing litter bins and ashtrays because they 'encourage' smoking. The argument about secondhand smoke is so weak that even the anti-smoking lobby rarely uses it in relation to the outdoors. Ultimately, it all comes down to saving smokers from themselves and 'denormalising' smoking. In Brighton, they say they want to protect children from seeing people smoking. In psychiatric hospitals, they say that patients/inmates would be healthier if they didn't smoke. None of these are legitimate reasons for creating criminal offences in a free society, but the sheer range of arguments used shows that the anti-smokers are fishing around for an excuse to further limit smoking, rather than identifying a problem and discovering that an outdoor ban is the solution. 'This new guidance is really important and timely. It is scandalous that so many people with mental illness are currently given no support to stop smoking.' Thus banning smoking is rebranded as 'supporting people to stop smoking.' And the priority of dealing with serious mental conditions before worrying about smoking is sidelined in the implication that smoking is a symptom to be treated, rather than a choice taken by a patient who also remains an autonomous human being. It's difficult to decide which is creepier, the idea that the state should force people into pristine health or the idea that adults should be role models for other people's children. Almost every anti-smoking political campaign now uses children in a way that will be familiar to scholars of totalitarian regimes. ASH bus them in to protest outside tobacco company AGMs, CR-UK use them in their plain packaging campaigns, and, as Josie Appleton says in the foreword of this report, they are used as puppets by local councils. Children do not go off and create 'no smoking' signs on their own; the dodgy verse is not a spontaneous work of a seven-year old. When children are sent on to beaches holding signs saying 'I want this space to be smokefree', they aren't speaking for themselves. They're being used to impose the agenda of others. The Manifesto Club have been running a tireless campaign against the over-regulation of public places for years. The point about public places, as Cummings says, is that they are for everybody. Most public spaces are - and should be - mixed use: children playing here, a busker there, a bar there. The fact that young people are present doesn't make that space a 'children's space'. The squares that banned smoking in Bristol were next to an aquarium and other child-friendly venues, but they were also near offices and around the corner from waterfront bars. The space is defined as a 'child space' only in order to justify restricting smokers. Sharing a public space requires tolerance, a quality that are absent in the soul of the health fascist. These bigots have taken every indoor public place in Britain. We should not concede an inch of ground to them outdoors. Let's not see any more scenes like the one in the video above. PS. If you're in London on November 11th, come and see me debate outdoor smoking bans in psychiatric hospitals. Tickets are free but going fast. Book here. So, Robert Lustig, the frustose-hating YouTube bloke who thinks that bees were put on earth to protect us from sugar, wants to prove that a calorie is not a calorie. Why? Because he wants a sugar tax and because he thinks that a calorie of fructose is more fattening than a calorie of anything else. He has produced some very shaky evidence for this hypothesis before and now he has conducted an experiment of sorts. Lustig got 43 fat kids and gave them a low-sugar diet for nine days. The kids were eating a lot of sugar before - it constituted 28 per cent of their energy intake. Lustig got them down to 10 per cent (which still isn't 'low sugar' to real sugar fanatics, but never mind.) Their overall calorie intake supposedly remained the same as it had been before the intervention. After the nine days, their weight had dropped by 0.9 per cent. Lustig takes this as evidence that sugar is uniquely fattening, or, as he puts it in the study, that 'the health detriments of sugar, and fructose specifically, are independent of its caloric value or effects on weight'. There are a number of problems with this. For a start, as Tom Sanders says at the Science Media Centre, its violates the laws of thermodynamics. Since the degree of weight loss observed would require a calorie deficit of 630 calorie per day, it is more likely that the kids under-reported their usual diet. Kids, like adults, always significantly under-report their calorie intake. If they said that they usually ate, say, 1,600 calories when they really ate 2,200 calories then the 1,600 calorie diet Lustig put them on would be a weight loss diet with or without sugar. Remarkably, there was no attempt to use a control group. This is such a basic flaw in the study that I'm surprised it was conducted, let alone published (OK, I'm not that surprised). Under-reporting of the usual diet would have been exposed if a control group had been given a calorie-controlled, high-sugar diet. Everybody would have lost the same amount of weight. Lustig tries to justify the lack of control in the study, but his excuses are laughable. He says that 'if subjects under- or over-estimated their baseline fructose consumption, then providing them their reported daily fructose content would be problematic'. It certainly would have been problematic (for Lustig) since anyone who under-reported and was given their 'usual' high-sugar diet would have lost weight, and wouldn't that have been awkward? Lustig also makes a risible appeal to ethics, saying that 'maintaining fructose at the same level, even within a study, is commensurate with the message that the change in macronutrient composition is important for their health, and in order to use the study as an “educational moment.”' Give me a break. There's a simple way to conduct a study like this. Give half the kids a 2,000 calorie per day diet that is high in sugar and give the other half a 2,000 calorie per day diet that is low in sugar. Make sure they eat it (don't just send them home with it, as Lustig does) and see what happens. I'll bet you the second law of thermodynamics that there's no significant difference between the two. This “child-friendly” study diet included various no- or low-sugar added processed foods including turkey hot dogs, pizza, bean burrritos, baked potato chips, and popcorn that were purchased at local supermarkets. Hot dogs, pizza, burritos, crisps and popcorn! Has Lustig told his good friend Aseem Malhotra about this miracle diet? Malhotra first appeared on the scene railing against 'junk food' in hospitals. Admittedly, that was in the days before he jumped on the anti-sugar bandwagon so maybe he's in favour of hot dogs and pizza now. It's difficult to keep up with his ever-changing views. It shouldn't be surprising that people can lose weight eating 'junk food' so long as they create a calorie deficit. This guy lost 56 pounds eating nothing but McDonalds because, whatever the cranks might tell you, a calorie is still a calorie. Barely a day goes by without us being bombarded with claims about the dangers of everyday foodstuffs. For the past 18 months, Britain has been gripped by an absurd panic about sugar, aided and abetted by Atkin’s Diet/low carb fanatics (who will be upset by today’s anti-meat announcement). We are all familiar with the warnings about saturated fat causing heart disease and salt causing hypertension. Last week we were told that cheese is ‘as addictive as heroin’. Now salami causes cancer and so does steak (probably). It would seem that the only way to stay healthy is to eat nothing at all. At Spectator Health today, is cheese as addictive as heroin? I was in Dublin on Thursday night debating big government tax intervention at Trinity College. While there I did a couple of interviews on the closely related topic of sugar taxes. Should you be inclined you can listen to me on Radio 4 PM (following John Ashton at 13:10) and on Five Live Question Time Extra (following Keith Vaz at 19:40). It's been all sugar this week but it looks like there will be a change of gears next week when the WHO declares processed meat to be a Class 1 carcinogen. What a time to be alive. In the meantime, if you're interested in the scientific debate around sugar (or fructose), this study is well worth reading. Public Health England's long awaited report on sugar was published yesterday. I say 'long awaited' but hardly anybody had heard of it until last Monday when Sarah Wollaston created a storm in a teacup by claiming it had been suppressed by the government. As Wollaston must have known, and as the media has gleefully reported this week, it included a tax on sugar amongst its recommendations. Many people seem to have misunderstood the purpose of the Public Health England report. It was not intended to be a cost-benefit analysis of anti-obesity policies. It was focused entirely on how sugar consumption could be reduced at the population level. Since that was its only aim, it is not surprising that a sugar tax was suggested as a possibility - albeit only the fourth best possibility, in the view of its authors. If I had been forced to write a report about how the consumption of sugar - or any other product - could be reduced, I would have mentioned taxation as well. The law of demand, arguably most basic concept in economics, is an obvious place to start. Nobody has ever denied that higher prices tend to lead to less consumption. The argument against a sugar tax is not that it would have no effect on demand, but that the effect would be trivial, the impact on obesity would be virtually non-existent and the impact on consumers would be negative and regressive. The authors of the Public Health England report did not weigh up the pros and the cons of a sugar tax because that is not what they were charged with doing. They did not need to look at the consequences, except those related to consumption. They did not even ask whether less sugar consumption would lead to less obesity, they simply assumed that it would. In one of the Annexes to the report, they explicitly state that they had “very little insight” into a host of issues, including “the difference in short and long term effects, the extent and nature of a regressive (and progressive) effect and an understanding of compensatory behaviours and their impact on individual and population level dietary intake and nutritional quality overall” - in other words, all the issues you'd need to look at to make a balanced judgement. This tells you a great deal about the mentality of the ‘public health’ lobby. They are strangely attracted to scarcity and want. For example, they have peculiar fetish for how Cuba made people slimmer through poverty. What we see in the paragraph above is an account of economic progress as a Bad Thing. We have "more choice than ever before", we have "more food outlets" and "food is cheaper than ever before". Food poverty has been virtually eradicated and our grocery bill is now a small fraction of our weekly outgoings. But rather than celebrating this triumph over scarcity, Public Health England portrays it as a step backwards and assert that "it's time to change". "None of this anyone's fault", they say, as if we might be tempted to point the finger of blame! Has it really come to this? Do we really have to feel bad about having more choice, lower prices and more disposable income? Besides, where has all this economic progress left us? According to Public Health England, the food we eat today is "very different to what we ate 30 or 40 years ago". They do not go into detail about what the differences are, but they do provide a citation to a DEFRA report entitled Family Food 2013 which notes that 'energy content of food purchases has been on a downward trend since 1965' and 'energy intake per person declined 31 per cent between 1974 and 2013'. If you dig around in DEFRA's source material, you can see that sugar consumption has declined by 16 per cent since 1992. This is confirmed by data on the availability of sugar which shows a decline of around 20 per cent since the 1970s. It is also confirmed by the National Diet and Nutrition Survey and Dietary and the Nutritional Survey of British Adults. We can argue about the exact size of the decline, but all the evidence points in the same direction. 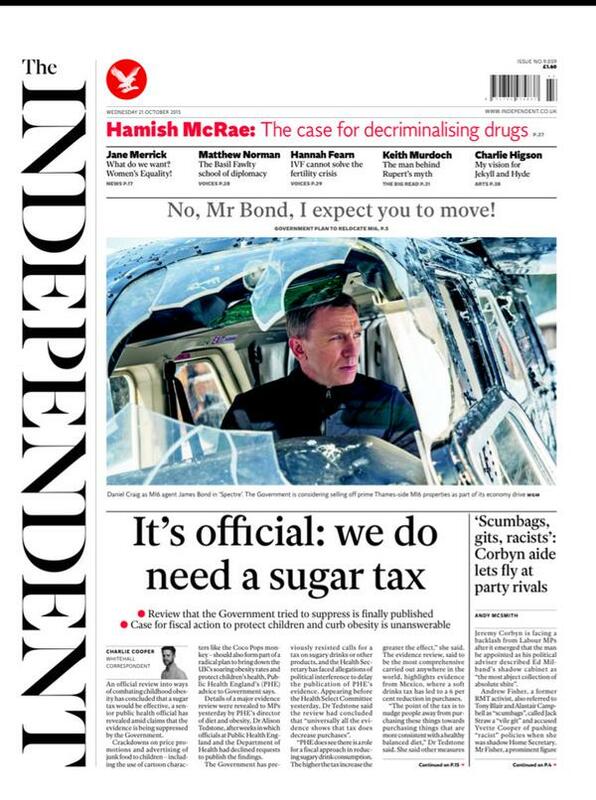 We eat less sugar today than we did in Public Health England's shangri-la of 30 or 40 years ago. We don't hear much about minimum pricing of vodka in Russia despite it being the only nationwide minimum pricing system in the world. You'd think that 'public health' types would keen to talk about what a success it's been. Alcohol producer Status Group has taken pole position in the Russian vodka market, as its lower prices lure buyers amid an economic slump, the RBC news agency reported Monday, citing market research. ... The company was boosted by a decision by Russia's alcohol market regulator to slash the minimum price for vodka from 220 to 185 rubles ($3.50 to $2.90) per half-liter bottle on Feb. 1 to fight increasing consumption of surrogate alcohol. Production and distribution of illegal liquor has boomed in recent years as the government pushed up alcohol prices through taxes and minimum pricing. It's no wonder they prefer computer models to real world evidence. I made a brief appearance on The One Show on Tuesday evening from Brighton promenade. You can watch it here - it's the first item. The presenter says on film that she keenly supports a sugar tax and that certainly comes through in the programme. It's worth watching the discussion in the studio afterwards to see an actor claiming that eight year old children today have eaten more sugar than people would eat in their whole lives 100 years ago. How can any sentient being believe such a thing? It shows how effective Action on Sugar's propaganda has been. As regular readers will know, sugar consumption is lower today than it was at the start of the twentieth century. I also wrote a post for Spectator Health discussing Jamie Oliver's appearance before the health select committee. Do have a read. So, the question is: what is the best country to emigrate to? I am speechless. There is nothing to add. Cheese might as well be called “dairy crack,” says Dr. Neal Barnard, founder and president of the Physicians Committee for Responsible Medicine. Your brain essentially reacts to it in the same manner it would to any addictive substance thanks to a protein found in dairy called casein, which is super concentrated during the cheesemaking process. If you can stand it, you can read more about this crippling addiction here and - better still - here. As always, the Battle of Ideas was stimulating, thought-provoking and exhausting. It was good to see some of you there. There were too many highlight to mention, but there are two things worth flagging up from the debates I spoke in. The e-cigarette panel, of which Lorrien was the undoubted star, included a representative from the Royal Society for Public Health (RSPH). The RSPH has made the news this year for demanding outdoor smoking bans and a totalitarian approach to town planning. Their man Duncan was fairly upfront about wanting to stamp out smoking at all costs and acknowledged that they were moderately supportive of e-cigarettes because it helped them be more draconian to smokers (a good cop/bad cop routine I have mentioned before). I have to say that Duncan gave the impression of someone who had never read around the subject at all. He spent a long time talking about what a useless drug nicotine is and how nobody gets any pleasure from using it (to a roar of audience laughter). He then pulled out a pack of Magic cigarettes which contain no nicotine and said that they were the future. Apparently I did an 'actual face palm' when he said this. Understandably so. Taking nicotine out of cigarettes is such a dumb idea that even the tobacco control racket rejects it whenever it rears its stupid head. For obvious reasons, it makes people smoke more. Moreover, it is prohibition. Not a bit prohibitionist, but actual prohibition. Nobody in 1920s America claimed that they were not living under prohibition just because it was possible to buy zero-alcohol beer (indeed, 'near beer' of 0.5% alcohol or less was legal). You take out the active ingredient and you prohibit the product, with all that entails. 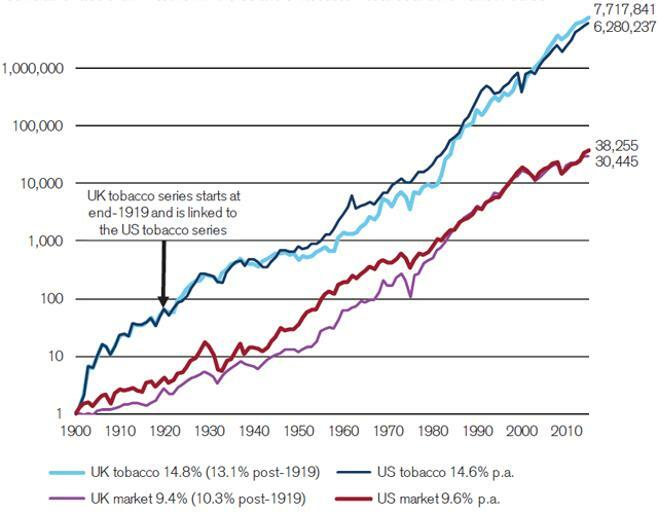 Moreover - and I didn't get the time to make this point - Duncan's Magic cigarettes are the exact opposite of the e-cigarettes we were there to talk about. Whereas e-cigarettes leave in the good stuff (nicotine) and remove the dirt, nicotine-free cigarettes get rid of the good stuff and leave in all the dirt. Turning up to a debate about e-cigarettes to promote their polar opposite suggests a total failure to grasp the issue. The second debate I participated in was on alcohol, specifically the question of whether 'booze Britain' has come to an end. There was a good deal of consensus that it had - it is hard to argue with the statistics - but I was interested to hear from Clare Gerada (head of the Royal Society of General Practitioners) that she thinks that the current drinking guidelines are based on no evidence and that the advice that pregnant women should drink no alcohol is also based on no evidence. This is undoubtedly true, but it was good to see her say so in public. Despite this, Sian Jarvis, who used to work at the Department of Health, said that the guidelines are likely to be lowered in the near future. Certainly, she said, that is what the Chief Medical Officer and other 'public health' authorities are going to recommend. Bring it on, frankly. The more ludicrous the advice, the less credibility the public health racket will have. First, the Battle of Ideas is on this weekend and is always one of the highlights of the year. As ever, the schedule is packed with interesting topics and engaging speakers. I'll be on two panels tomorrow, Planet of the Vapes: Why is there a war on e-cigarettes? and The End of Boozy Britain? The titles speak for themselves and the medical establishment is represented by Clare Gerada for the latter and Richard Smith for the former. Smith wrote a blog post about e-cigarettes this week which is worth reading. 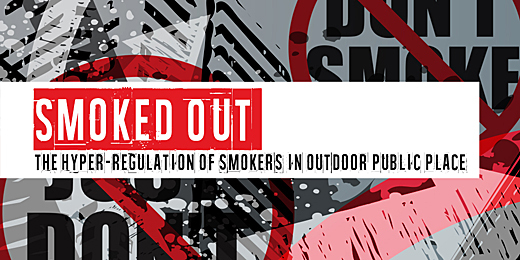 Second, on Wednesday the IEA will be hosting an event to launch the publication of the Manifesto Club's report on outdoor smoking bans. The Manifesto Club have been doing a fine job of campaigning against the over-regulation of public places for years. See here for details. Third, speaking of outdoor smoking bans, I will be debating whether outdoor smoking should be banned in psychiatric hospitals on November 11th at King's College. Deborah Arnott and Simon Wesseley will be on the other side. Tickets are free but limited, so if you want to go please book now. Finally, the IEA is holding an event to mark the tenth anniversary of so-called 24-hour drinking on 17th November. Tickets are free for this as well - please RSVP here. There have been a lot of pseudo-exposés of food industry funding of science recently. I wrote about why that might be for the Spectator. Do have a read. Graham MacGregor (Action on Sugar): "Most countries see this as an escalating tax. They start off at ten per cent. Mexico now wants to go to twenty per cent. France has gradually increased it. Finland last year was blocked by the food industry - everywhere you see the power of the food industry trying to block these moves [nurse! - CJS] - but like alcohol and cigarettes, once you'ved started you gradually screw it up [he means racket it up - CJS] . It becomes like cigarettes. There's something like an 800 per cent tax on cigarettes now and yet we're quite happy with that." And if you think diet drinks (ie. sugar-free drinks) will escape, MacGregor wants to tax those as well because they give people the taste for sweetness. The word 'fanatic' hardly suffices. I really recommend you watch this mad bugger in action to see what liberals are up against. It always amazes me how we can scoff at the Carrie Nations and Mary Whitehouses of the past without seeing them in our own time. I appeared before the Health Select Committee on Childhood Obesity this morning. I'd like to believe that I was asked because I'm the voice of reason but I suspect it was to be the grit in the oyster. The 'childhood' part is just framing. I think I was the only person to mention children at all. As far as I can see, the aim of the committee is to send a message from the wingnut end of the 'public health' movement about obesity to act as ballast to whatever the government comes out with in its forthcoming obesity strategy. Perhaps I'm being unfair, but the guest list for this committee suggests not. They've got two Action on Sugar loons (Capewell and MacGregor) plus their puppet Malcolm Clark (Children's Food Campaign) and useful idiot Jamie Oliver. Oliver has a whole session to himself next Monday in which he can promote his business interests present his scientific data. If a sugar tax were combined with a "reformulation" of foods to remove fat as well as a ban on all advertising of unhealthy food, the UK "would prevent childhood and adult obesity" and end type-2 diabetes in the UK, Prof MacGregor says. So he doesn't just want to reduce sugar and salt (he is also chairman of Consensus Action on Salt and Health), he also wants to 'remove' fat. And he thinks this will eliminate all forms obesity and Type-2 diabetes. People like MacGregor are the libertarians' best hope. Even the small group of newly elected doctors and teachers in the committee must have found this a bit hard to take. Do these self-important, unelected monomaniacs ever consider that shouting at ministers might not be the best way to win hearts and minds? PS. I was also on Channel 4 News last night with Sarah Wollaston. The item is quite brief because she wouldn't say either of the things they wanted her to, ie. 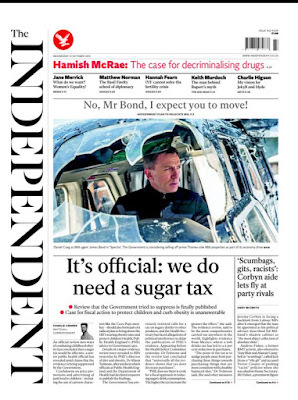 that Jeremy Hunt had suppressed an evidence review and that Britain should have a sugar tax. You can watch the clip here. A couple of case studies of desperate self-justification by trigger happy prohibitionists grabbed my attention this week. Energy drinks are highly sweetened, caffeinated beverages that are packaged in brightly coloured, slimline containers. They’re sold virtually everywhere. Here we go again with the 'glitzy packaging' guff. And note the implication that their popularity is the result of widespread availability rather than vice versa. Energy drinks may pose serious harm for people aged 18 years or younger. Research with young adults indicates the stimulant effects can cause headaches, sleeping difficulties and heart palpitations. These side-effects are generally attributed to the primary ingredient, caffeine. Do any of these things really count as 'serious harm'? I think not. But even if you think these are significant enough problems to justify government action, it is clearly caffeine that is the issue, not a single product category that happens to contain caffeine. The effects of energy drinks typically mimic those reported in cases of caffeine intoxication, such as anxiety, agitation, insomnia, heart palpitations. The cardiovascular effects of caffeine, such as higher blood pressure, may be contributing to increased disease. 'May be'. These are weasel words. Evidence or shut up. Young people have a lower caffeine tolerance and are therefore more vulnerable to the negative effects of caffeine. OK, so you want to ban kids from buying caffeinated products then, right? Starting with the most popular caffeinated product in the world, coffee? The Australia New Zealand Food Standards Code specifies that energy drinks may contain a maximum of 80 milligrams of caffeine per standard 250 millilitre energy drink. This is equivalent to the amount of caffeine in a cup of instant coffee (77.5mg/250ml). Wow, a whole cup of coffee, imagine that! And that's the maximum permitted in an energy drink, though not the maximum permitted in a cup of coffee. So we're banning coffee, right? Standards for the package labelling mean manufacturers must provide a maximum recommended daily intake, and warn against consumption by pregnant women, those who are sensitive to caffeine and children. Nothing more should be required in a free society. In practice, labelling is typically of poor visibility (located near nutrition information in indistinct text colour and size), with no specific age limit for children. If that is so, campaign for these technical issues to be resolved. Don't campaign for a ban. Research suggests energy drink users often exceed recommended maximum daily intakes. So what? It's only a recommendation. What has been the result of this? Are bodies piling up in the streets? Are hospitals filled with teenage heart attack victims? There is a lack of evidence showing energy drinks are safe. That's not how it works, sunshine. They've been on the market for more than twenty years. If there was evidence that they were dangerous, it would have surfaced by now. You're the plonkers demanding a ban. You provide the evidence. So as a precautionary measure, governments should ban their sale to anyone under the age of 18 years. Ha! No dice. The precautionary principle is what prohibitionists resort to when they have no evidence so it's no surprise to see it invoked by these cockwombles. However, it's a bit late for precautionary measures. These drinks have been consumed for long enough for any deleterious effects to make themselves known. Moreover, coffee - which contains as much, if not more, caffeine per drink - has been consumed for centuries without any real problem. In Britain, for example, coffee has been wildly popular since the 17th century so you're about 400 years too late for the precautionary approach. The data are in. You've lost. Such a ban could be lifted if, down the track, the evidence shows they are indeed safe. As with many products that are commercially available and can adversely affect health, the industry associated is extremely powerful. It has sophisticated marketing techniques to groom children and ten-year strategies to engage and coerce governments. Their sole motive is profit. Yawn. The clichés are coming thick and fast in this article. I don't know how these people don't bore themselves. The article is published at The Conversation, however - a state-funded propaganda site where words like 'profit', 'industry' and 'sophisticated marketing' are dog whistles (not to mention the absurd and offensive use of the term 'groom children'). Payday loan commercials could face curbs on TV advertising after the body responsible for setting the UK advertising rules announced a public consultation on the issue. The Broadcast Committee of Advertising Practice (Bcap) - the code-setting body for all TV and radio advertising, has launched a consultation assess whether campaigns by payday loan companies such as Wonga should be given “scheduling restrictions” barring them from airing in shows when large numbers of children are watching. Wh..wh..what? Since when did children take out payday loans? Bcap has launched the consultation after receiving submissions from campaigning groups including the Children’s Society. Yet another state-funded charity lobbying the government (the Children's Society gets £14,000,0000 from the taxpayer). What's rattled their cage? “We are pleased that regulators appear to be listening to the many parents who share our concerns about the damaging impact of adverts for high-interest loans on their children,” said Matthew Reed, chief executive of the Children’s Society. And what the hell is this 'damaging impact'? “Commercials with singing satsumas, Christmas presents and catchy jingles make borrowing money seem easy and fun to children, which increases the pressure on parents to take out high-interest loans." In what universe has this ever happened? The only thing more pathetic than parents demanding that the government protects them from their own children is a sock puppet charity doing it for them. 'Pester power' is the single lamest justification for advertising bans anyone could ever make. It's feeble when talking about breakfast cereals and football shirts, but payday loans? Are you kidding me? The key word here is 'irresponsible' because it tells us what's really going on in the minds of the Children's Society. Like many a left-wing puritan, they don't like Wonga and they don't like payday loans. This has got nothing to do with children or education. It's about limiting adults' exposure to services which these people think are immoral. However, campaigners look set to face an uphill battle to get any TV ad ban introduced on advertisers in the sector, officially known as high-cost short-term credit ads, with Bcap stating that evidence-gathering to date has not convinced it. Good. Thank God there are still a few regulators holding out against the hysterics of the twenty-first century. 'Alcohol Sports Sponsorship: Is It Time To Cut The Tie?' (the speaker is from the UK Temperance Alliance so the answer will be yes). This is a tiny selection of the vast number of presentations and panel discussions that are being held at the conference this week. As with tobacco control conferences circa 1983 (when the anti-smoking movement became explicitly neo-prohibitionist) the main themes are advertising, price and advocacy (ie. lobbying). You only need to look at the list of speakers to see that there will be no meaningful debate. Aside from the aforementioned Gerard Hastings - who has declared 'war' on alcohol - there is Eric Carlin, various members of the Institute of Alcohol Studies (AKA UK Temperance Alliance), Robin Room, Jim McCambridge and various state-funded temperance nags like Colin Shevills from the still not yet de-funded Balance North East. The opening addresses were given by Derek Rutherford and Nicola Sturgeon. This tells you everything you need to know about the unholy alliance between gospel temperance and the Scottish state. I have written about Rutherford's extraordinary network of booze-hating organisations before. Most, if not all, are taxpayer-funded and this week's conference is taxpayer-funded via the Scottish government, the NHS and the WHO. I can't think of anything worse than spending three days rubbing shoulders with these lemon-sucking cranks, but since it is a publicly funded conference any member of the public should be entitled to attend. Thank you for registering for the GAPC conference, however, on reviewing your registration we note that you work in/are affiliated to the alcohol industry. If you have already paid for your booking a refund will be arranged and sent to you in due course. Kind regards, my eye. Whatever happened to 'nothing about us without us'? It's bad enough that we are forced to pay for a Methodist teetotaller to hold a three-day crusade against the demon drink without them doing it in secret. If these people thought that their agenda was defensible, they would have industry spokespeople on the stage debating them, not banned from attending. What a shameful, paranoid, tax-sponging, parasitic bunch of charlatans the 'public health' racketeers are. I've seen the BBC's typically fawning account of this pretend public health conference. The Scottish government has been praised for its "political courage" in attempting to introduce a minimum unit price for alcohol. It came from the Global Alcohol Policy Alliance (GAPA) which aims to counter the health problems created by alcohol consumption. The Beeb doesn't bother to ask what the Global Alcohol Policy Alliance is. Perhaps 'Taxpayer pays for international temperance shindig' wouldn't sound as good. Derek Rutherford, who chairs GAPA, said holding its annual conference in Scotland would acknowledge the work being done there to reduce the harm caused by alcohol. Nor does the Beeb ask who Derek Rutherford is, or why the taxpayer has to fork out for a teetotal Methodist to promote his agenda. 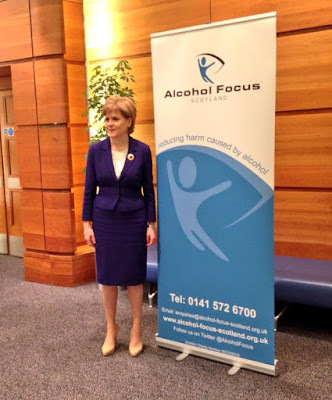 Dr Mac Armstrong, chair of Alcohol Focus Scotland (AFS), the national charity working to reduce alcohol harm, said: "The Scottish government's plans to introduce minimum unit pricing for alcohol will increase the price of the cheapest, strongest drinks. Alcohol Focus Scotland gets hundreds of thousands of pounds from the Scottish government every year, but this doesn't warrant a mention. The SNP have naturally press released the praise they've received from their clients. Monday 8 am: What works in reducing obesity? Next steps in public health with Maggie Throup MP (Health Select Committee), Chris Askew (Diabetes UK), Sarah Kershaw (2020 Health). Exchange 8. Monday 3.45 pm: E-cigarettes: setting the regulatory bar - how high is too high? with Clive Bates (Counterfactual), Christian May (City AM), David Morris MP. Techcentral. Tuesday 11.15 am: Sock puppets: Should the state be funding pressure groups? with Paul Staines (Guido Fawkes), Sir Stuart Etherington (NCVO), Daniel Hannan (MEP). Think Tent. Tuesday 5.45 pm: Can wellbeing usurp economic indications of success? with Dame Jil Matheson (ex-ONS), Juliet Michaelson (New Economics Foundation), Nigel Keohane (Social Market Foundation). Exchange 4-5. Anti-smoking fanatics are celebrating today because it's now a crime to smoke around people under the age of 18 in cars. The issue of secondhand smoke in vehicles is utterly trivial and the immense effort that has gone into this political campaign only makes sense when you understand that it is about setting a precedent for banning smoking in private, domestic environments. Obviously, the 'public health' charlatans don't care about children any more than they care about bar-workers. All they care about is using state force to stop people smoking. Equally obviously, it won't end here. It's worth remembering that this is Labour legislation and Labour's shadow health secretary is quite rightly taking the credit for it. Ten years after they last won an election, the Labour party is still passing legislation through the unelected House of Lords. They did exactly the same thing with plain packaging. A tax on plastic bags in coming into effect next week. Labour, Tory, it makes no difference. Nanny always wins. You have to wonder what the BBC defines as "smoke" and whether they've ever been in a moving vehicle. Or a stationary vehicle, for that matter. “People think that by opening the window they are clearing the air, but what actually happens is the air is sucked in from outside and pushes the smoke backwards, straight towards the passengers in the back seat." Don't you love the way cars defy the laws of physics by sucking air in without blowing air out? What are they, black holes? The manner in which academics are prepared to degrade themselves in the pursuit of money and ideology is pathetic, but expect more of the same in the future. Who knows what new magical properties secondhand smoke will be found to have. Perhaps they'll even try to revive the 'thirdhand smoke' scam? As the political objectives become more and more draconian, there are always new depths to plunge.